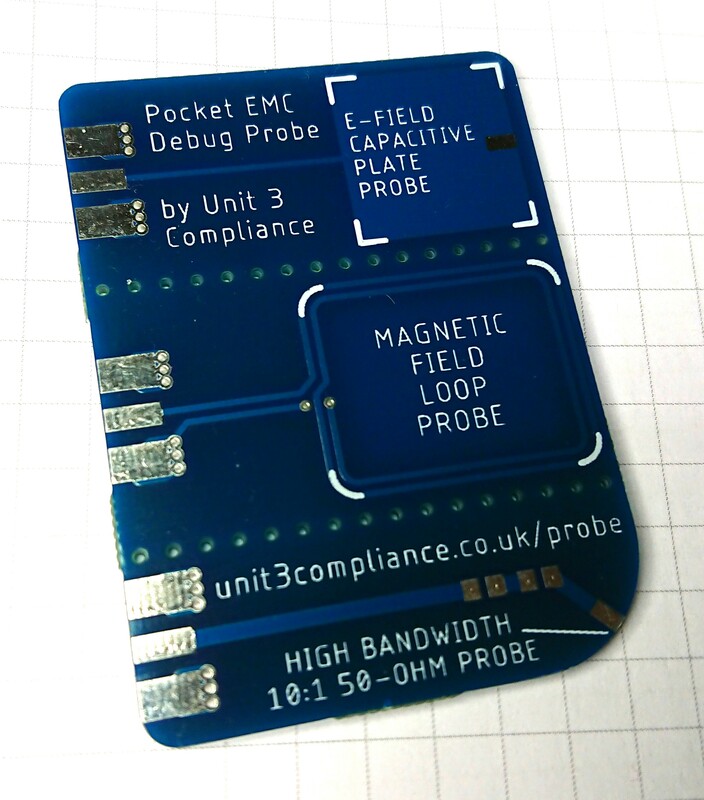 If you are reading this then hopefully you are a lucky owner of a Unit 3 Compliance Pocket EMC Debug Probe and love it so much it goes everywhere with you, in your toolkit, on your keyring, or in your shirt pocket. Dazzle your colleagues*, impress your manager and baffle your children by knowing exactly what to do with it. * Note: Colleague be-dazzlement is not guaranteed. Some assembly required. May contain nuts. Near field probing is a useful way of investigating the EMC characteristics of your system in a workbench environment. Most commonly these probes are used to identify problem areas of a design when a specific frequency has been spotted during emissions testing. Building your own probe set is often a rite of passage for EMC engineers across the land but this board saves you the trouble. 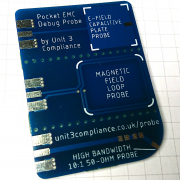 The Pocket Probe has three sensors which I most commonly use for debugging problems with customer’s products. These are covered below in some more detail. The probe works best with a spectrum analyser to look at the frequency components of the noise. However you can use it with a high speed digital oscilloscope and either look at the FFT of the captured waveform or just the amplitude data in the time domain. Edge mount RF connectors – the PCB is designed to take SMA edge mount connectors but you can solder a coaxial cable onto the pads at the expense of ease of swapping the connection between probes. Some of the PCBs have pads that are spaced slightly wider than a standard SMA connector but solder can be used to bridge the gap no problem. The construction is fairly self explanatory, the R and C go on the two component pads in the bottom right hand corner. The probe tip is soldered to the pad on the curved corner. This captures the magnetic field emanating from current loops. Orient the loop to match the geometry of the loop you wish to measure for maximum pickup. Spend some time experimenting with orientation position to see how it affects the received signal. Getting the probe close to the surface is the hardest part. If the geometry of the probe doesn’t suit the application don’t be afraid to modify it. Solder some copper foil or tape onto the end and wrap it in insulation tape. This gets you closer to the surface of the PCB without the risk of shorting things out. Remember, the closer the better. Once you’ve isolated the area of a circuit board that is noisy then direct probing of PCB traces comes into it’s own to identify the culprit. The chances are most of the scope probes that you have on your bench have an 3dB bandwidth limit of between 100MHz to 350MHz. Radiated emissions problems most often manifest themselves at frequencies between 200 MHz and 1000 MHz. This limits the usefulness of a standard probe for EMC problem solving. HF probes are available but are expensive and less robust. This is a super effective, robust, low cost version of those probes. The equivalent circuit is simple, a 430 ohm resistor and a 100nF capacitor are in series with the probe tip. When connected to an instrument with a 50 ohm input impedance this makes a passive 10:1 probe which has a nice balance of high frequency performance and lower circuit loading effects. The resistor gives the 10:1 part and the capacitor prevents you from blowing up the input stage of your spectrum analyser if you are probing onto lines with DC content. It also gives you more repeatable measurements when doing A to B improvements to your circuit than using the other probes. How to use it? Connect to your measurement instrument and start poking around the traces or pins in the “hot” area that you’ve identified using the above probes. Chances are you’ll narrow down the problem pretty quickly. Why isn’t there a ground lead? The capacitance between the ground plane of the circuit board, your hand and the cable forms a virtual ground lead. File the tip to a point if you like for probing onto fine pitch SMT pins. Sometimes the signals are just too small to measure and you need a little more gain. For the most part your problem signal should stand out but there are things you can do if you need more volume. If your spectrum analyser has a built in pre-amplifier then turn that on – it’s sometimes under the amplitude menu tree. If you don’t have an internal amplifier then the LNA4ALL is a great external amp for this kind of work. It has a 50MHz to 4GHz bandwidth and is available with options to add ESD protection, operate it from 5V, or a case to mount it in. For only a few Euros it’s a great device. Pair this LNA with a back to back SMA connector to enable mounting the amplifier directly to the probe board for ease of handling. If your spectrum analyser has a Probe Power connector on the front you can tap power from this to run the probe. I made up a lead to use the PS/2 keyboard port on the front of my spectrum analyser for this same purpose. You can also connect the probe to an RF signal generator and use it to inject noise into circuits. This is a useful way to measure the immunity performance and identify susceptible circuits. Putting a 3-6dB attenuator in series as a matching pad can reduce the effect of the probe and circuit impedance on the RF generator signal amplitude. You can use this on any of the three probes on the board, give it a try to see what happens. 1m SMA to SMA cable made from RG-316 flexible coax. I like SMA cable like this as it’s nice and thin and doesn’t feel cumbersome when you are probing fine pitch surface mount devices. Assuming your spectrum analyser has a N connector for it’s input then pick up a N male to SMA female adapter if you don’t already have one. SMA to BNC adaptors are also available. Please let me know how you get on with the probe, send me any design suggestions or ask any questions. I’ll be happy to help.